I was seen by Dr. Adams, very nice, professional and knowledgeable. Waiting time was over an hour but my problem gottaken care of perfectly. I was seen by Dr. Adams, very nice, professional and knowledgeable. Waiting time was over an hour but my problem got taken care of perfectly. 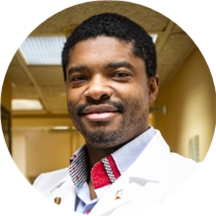 Kelvin Barry is an experienced podiatrist serving the community of Brooklyn, NY. Dr. Barry attended the New York College of Podiatric Medicine, where he received his podiatric degree, and he completed his residency in podiatric medicine and surgery at Interfaith Medical Center. He also holds a bachelor’s degree in Biological Sciences from Brooklyn College of the City University of New York. Dr. Barry is a part of NYC Brook Medical LLC and is board certified by the American Board of Multiple Specialties in Podiatry. He is affiliated with Interfaith Medical Center in Brooklyn, NY. Dr. Barry is a member of the Pi Mu Delta National Podiatry Service Society, the New York College of Podiatric Medicine Alumni Association, the Brooklyn College Alumni Association, Phi Sigma Chi Fraternity Alumni Dr. Barry is devoted to ensuring the longevity of his patients’ health and developing long-lasting relationships with them. He takes his time to understand symptoms and give correct diagnoses to ensure the continued health of all his patients. Great guy, in and out in 30 minutes, gave me a clear diagnosis and a referral for ultrasound and Xrays. Excellent bedside manner, would definitely come again. Dr. Barry was very easy going along with providing necessary information. I was seen by Dr. Adams. Wonderful doctor! Very informative! Highly recommend. Dr. Barry was friendly, completely present, had a good sense of humor and was very thorough. Dr. Barry was very professional, he took the time to listen to my concern. I would definitely recommend him???? Patient yet right to the point! Dr. Barry is very thorough. He takes time to explain what he is doing and addresses all concerns. He provides excellent treatment. He seen and treated problems that my PCP blew off...thanks to Dr Barry O may not loose another foot. He is very knowledgeable about his profession He is honest and to the point . Everything you need in a doctor.